VIENNA, VA--(Marketwire - Oct 26, 2012) - Eloqua (NASDAQ: ELOQ), the marketing system of record for modern marketers, today released the "Grande Guide to Social Selling," a free eBook that shows why top-performing salespeople are tapping into social media, the tools they use to build lasting relationships with buyers, and the step-by-step strategies that lead to success. Written by Craig Rosenberg (aka "The Funnelholic"), and featuring contributions from seven other sales leaders, the interactive guide is packed with knowledge readers will come back to again and again. The latest installment in the award-winning series, the "Grande Guide to Social Selling" delves into how sales functions in a digitally networked world. Salespeople are feeling the pressure to position themselves as trusted advisors. The Grande Guide gives sales professionals, and their organizations, the strategies, tactics, tools and guidance to make their sales process socially savvy. "Everything and nothing has changed about modern sales and marketing," said Alex Shootman, President of Eloqua. "Twenty years ago, if a sales person asked me how to find buyers, I would tell them to go hang out where the buyers are and be interesting. Social media is now where buyers hang out, making it possible to grow and enrich your network like never before. The 'Grande Guide to Social Selling' provides the do's and don'ts for those looking to become the trusted voices in their market." The "Grande Guide to Social Selling" is available for download today. Together with the "Grande Guide to Social CRM" and the "Grande Guide to Social Demand Generation," organizations have a trilogy of resources for using social media through every stage of the modern marketing and sales process. Eloqua (NASDAQ: ELOQ) is the marketing system of record for modern marketers. The company's cloud software, professional services and education programs provide marketers with the technology and expertise needed to help marketing drive revenue. More than 100,000 global users from companies both large and small, rely on the marketing automation power of Eloqua to improve demand generation and lead management while driving more qualified leads. Eloqua's customers include AON, Dow Jones, ADP, Fidelity, Polycom, and National Instruments. The company is headquartered in Vienna, Virginia. For more information, visit www.eloqua.com, subscribe to the It's All About Revenue blog, call 866-327-8764, or emaildemand@eloqua.com. Eloqua's Grande Guide to Social Selling provides readers with best practice advice around tapping social media to build lasting relationships with buyers. 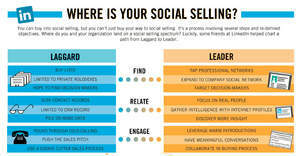 The interactive guide features fun infographics on social selling strategies.